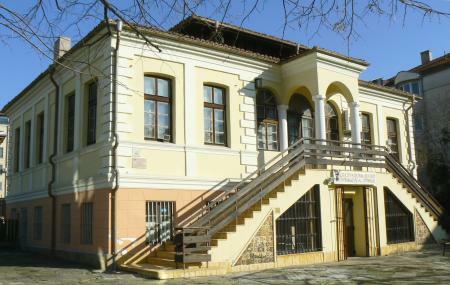 Set inside a beautiful 19th century house, the fourth division of the Burgas Regional Museum focuses on the people – traditions, costumes and everyday life. The most popular exhibit – the permanent one – shows the various clothes worn by the various ethnographic groups in the Burgas territories, including those of the Greek and Turkish migrants. Like the other regional museums, it’s best to have a local who can understand the written info, which is unfortunately written in Cyrillic or Bulgarian. Sunday and Monday: Upon request. People normally club together J- Craft Jewellery Shop and Natural History Museum while planning their visit to Ethnographic Museum. A very nice little museum. It tells the story of the clothing worn by rural/native people in Bulgaria. They also have looms that show how some of the clothes were made. Most of the displays have text in Bulgarian and English. Plan on spending no more than 45 minutes. Gelenksel Bulgar kültürünü daha yakından tanimak isteyenler icin ziyaret etmenizi öneririm.